The process is very similar to the previous patchset installations. I created it for myself, mostly for comfortable copy/paste of command lines. As described in OBIEEBUNDLE PATCH 11.1.1.7.140415 AKA 11.1.1.7. (?) is available, first download the single big patch file of Patch 18283508 and the small file of Patch 16569379 (you need 16569379 only if you didn't install it with 11.1.1.7.1 ... or later, I’ll refer to it in the description, but you can disregard it if you already installed it). Unzip the patches. You should have 2 directories named by the patch number. Now in the directory 18283508, you have 8 zip files and a useful readme.htm. 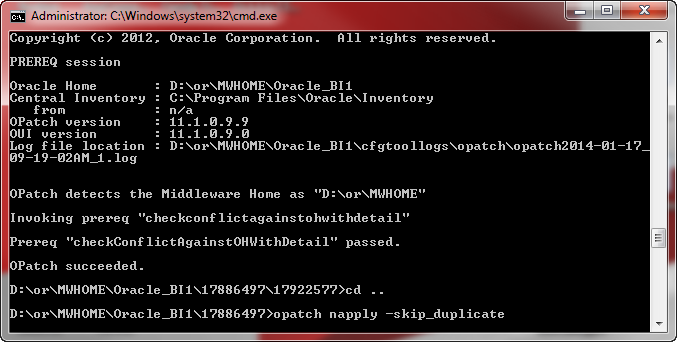 You are advised by the readme to move the 18283508 directory to prod_mwhome\Oracle_BI1. Unzip all 8 zip files. At the moment you should have 8 directories under prod_mwhome\Oracle_BI1\18283508. PLEASE read carefully section 3.1 if you are upgrading from 11.1.1.6.X. Especially 11.1.1.6.12. In section 3.2 we are advised to check conflicts. I promise to do it later, after I set the path and Oracle_Home. The <Oracle BI Home>\bifoundation\server directory. 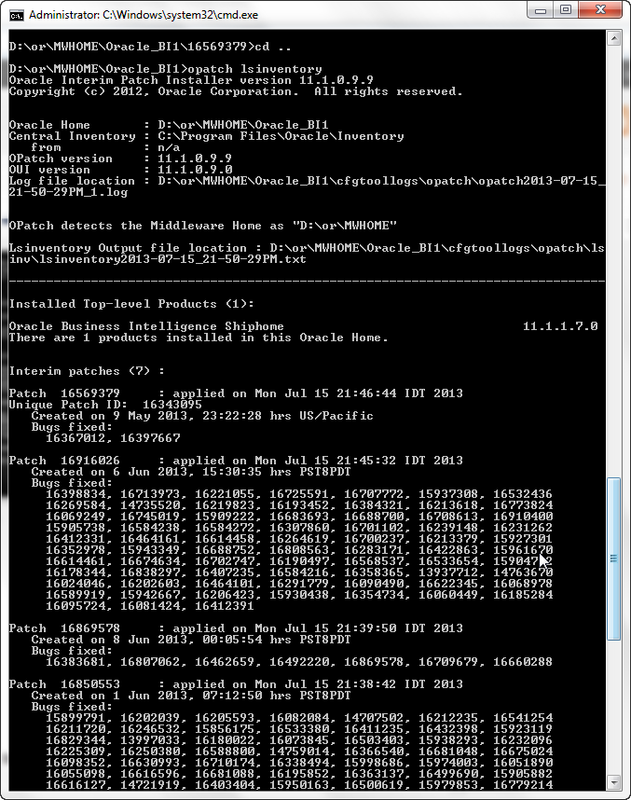 The <Oracle BI Home>\bifoundation\jee\mapviewer.ear\web.war\WEB_INF\conf\mapViewerConfig.xml file, if you have modified it. In my case it's D:\MWHOME\Oracle_BI1\bifoundation\server and D:\MWHOME\instances\instance1\bifoundation\OracleBIServerComponent\coreapplication_obis1\repository. I prefer to backup D:\MWHOME\instances\instance1\bifoundation\OracleBIPresentationServicesComponent\coreapplication_obips1\catalog as well. Please note: If you changed configuration files or added pictures not in AnalyticsRes folder (as described here, back the changes as well. They will be erased by the patch). In point 3 you are advised to stop the BI System and told how to do it, step by step. It's all very nice but to me it looks simpler just to run "Stop BI Services" from the Start/All Programs/Oracle Business Intelligence menu. I guess we see the full details due to Linux needs (and anyway, it's very educational). Point 4 advises to clear cache: from prod_mwhome\Oracle_BI1\bifoundation\web\catalogmanager\configuration\ (in my case D:\MWHOME\Oracle_BI1\bifoundation\web\catalogmanager\configuration\) you should delete 2 files (if they exist) org.eclipse.osgi & org.eclipse.equinox.app. 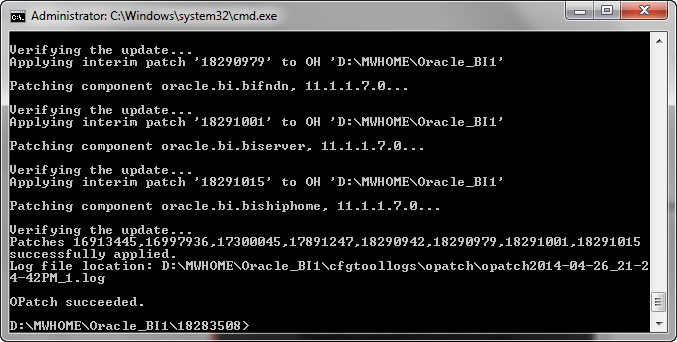 As you remember we have directory 18283508 with 8 sub-directories in prod_mwhome\Oracle_BI1 (in my case D:\MWHOME\Oracle_BI1). make sure the extracted directory 16569379 is under prod_mwhome\Oracle_BI1 as well, only if you didn't install this patch before (you did, if you installed 11.1.1.7.1 or later). Open CMD prompt as Administrator on prod_mwhome\Oracle_BI1. (Right Click with Shift pressed on the CMD or Right Click and CMD here as Administrator in the File Browser or check the start menu). 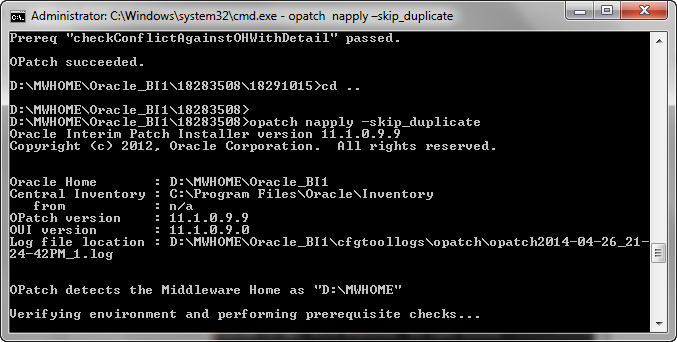 DON'T leave empty spaces in the set, such as set ORACLE_HOME= D:\MWHOME\Oracle_BI1. Right Click does the paste action in CMD window. Now if you remember we need to conflict detection from section 3.2. In point 10 we have 2 options: Run Once all 8 patches or do each manually. Since I don't enjoy tedious manual labor, I preferred the first option. 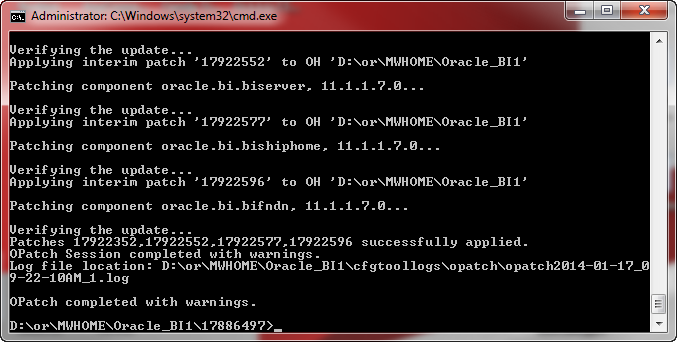 We will return to the basic prod_mwhome\Oracle_BI1\18283508 directory and run opatch. This time I installed the patch on fresh 11.1.1.7.0 installation, so I was asked once "Do you want proceed?" on finished the installation without warnings. If you installed one of the bundle patches before, you will be asked twice "Do you want proceed?" The identical patches are skipped. It's all because of previous patches components that are the same in this bundle. As I said twice before, only if you didn't install 16569379 before, go to directory 16569379 and Run opatch apply (in both types of installation). You are advised to check all patches were applied using opatch lsinventory. 14. Copy the BIPublisherDesktop32.exe and BIPublisherDesktop64.exe files from the prod_mwhome\Oracle_BI1\clients\bipublisher\repository\Tools directory to the prod_mwhome\user_projects\domains\bifoundation_domain\config\bipublisher\repository\Tools directory. In my case, from D:\MWHOME\Oracle_BI1\clients\bipublisher\repository\Tools to D:\MWHOME\user_projects\domains\bifoundation_domain\config\bipublisher\repository\Tools. 15. Copy the msmdacc64.dll file from the <Oracle BI Home>\clients\bipublisher\repository\Admin\DataSource directory to the prod_mwhome\user_projects\domains\bifoundation_domain\config\bipublisher\repository\Admin\DataSource directory. There seems to be a problem here since the source does not exist. I don't know if it's a documentation bug or missing file. Had the same thing in 11.1.1.7.1 and later. A. Go to the directory containing the jsp_servlet subdirectory (using a file manager application or the command line). If it exists, then the jsp_servlet subdirectory is located in one of the directories below the <Middleware Home>/<Domain Home>/servers/bi_server1/tmp/_WL_user/bipublisher_11.1.1 directory. B. Look in each directory below <Middleware home>/<Domain home>/servers/bi_server1/tmp/_WL_user/bipublisher_11.1.1, and remove any jsp_servlet subdirectory that you find. 17. If you backed up mapViewerConfig.xml because it had been modified, then copy the backed-up file to its original location at <Oracle BI Home>\bifoundation\jee\mapviewer.ear\web.war\WEB_INF\conf\. Now you should be able to start the server, but before you do, there is one more part not in the readme file. You might remember the post of Abhinav Agarwal Smart View Version to use with OBIEE 11.1.1.7.1. You don’t have to repeat it if you have done it with 11.1.1.7.1 or later patches. Backup <Oracle BI Home>\clients\epm\SmartView (In my caseD:\MWHOME\Oracle_BI1\clients\epm\SmartView), extract the content of the Zip file to that directory. You might want to delete the patch installation files from <Oracle BI Home> and free the 2.5GB of disk space. Now you can start up the server. Before you do you might want to have a look at section 5.2 bellow (it requires you to stop the serer again). Bon Voyage. The Oracle white paper "Customizing Oracle Business Intelligence Enterprise Edition 11g" describes how to customize Oracle BI Presentation Services by storing custom skins, styles, and messages in a custom directory. 1.Copy the BIChart.swf file from the <Oracle BI Home>\bifoundation\web\appv2\res\sk_blafp\dvt directory to each custom directory in the BI System, replacing the existing file of that name. If you installed (and followed instructions) 11.1.1.7.131017 or later, you already have done this part. 2. Navigate to the /instances/instance1/config/OracleBIJavaHostComponent folder. b . In the xdo.cfg file, change the setting for xlsx-keep-values-in-same-column to True. (See note 1632002.1 at Oracle Support if you don't know what they are talking about). 4. Start the WebLogic Administration Server (and Managed Server and BI System). Also see document "OBIEE 11g: How To Improve the Functionality of Exporting Data from Analyses, Dashboards, and other Oracle BI Presentation Catalog Objects into Microsoft Excel with OBIEE 11.1.1.7.131017 and Later (Doc ID 1595671.1)" at Oracle Support Site, about changing the value value="-server -Xmx2048M from value="-server -Xmx1024M in the file config.xml of opmn. Deinstall the Oracle Business Intelligence Client Tools from every computer where the client tools have been installed by following the instructions in Chapter 5 of Oracle Fusion Middleware Installation Guide for Oracle Business Intelligence. Reinstall the Oracle Business Intelligence Client Tools on every computer where the client tools have been deinstalled by following the instructions in Chapter 5 of Oracle Fusion Middleware Installation Guide for Oracle Business Intelligence.